The back cover of this ca. 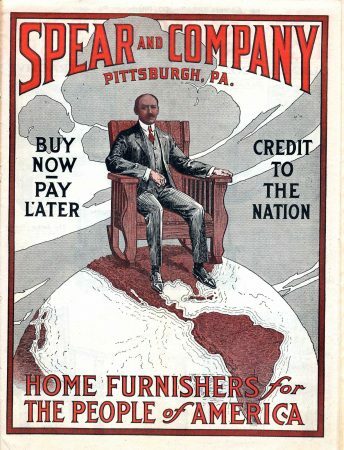 1903 Spear & Company catalog is really rather sweet, in copy and illustrations. 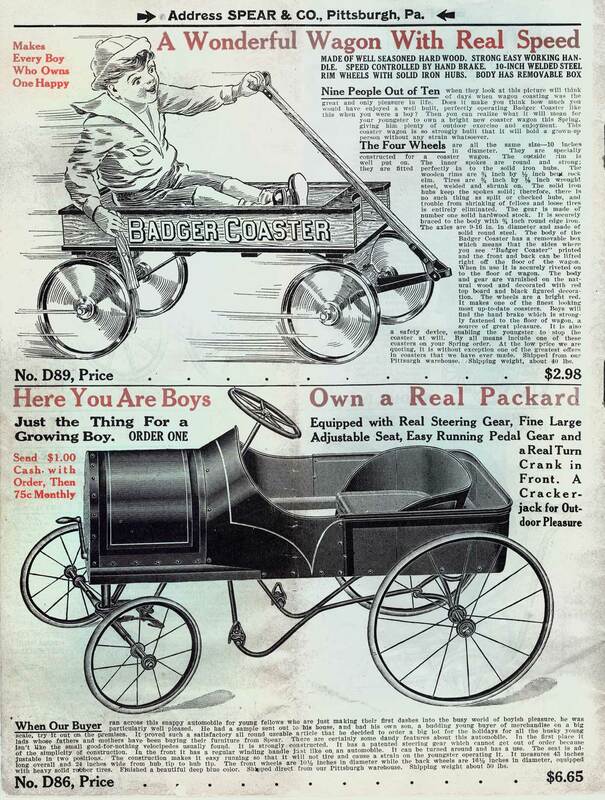 The tyke is happy, and so is the copywriter: “Nine people out of ten when they look at this picture will think of days when wagon coasting was the great and only pleasure in life.” I get the feeling the writer was one of those nine, reflecting back on simpler times compared to the complicated, overwhelming adult life…of 1903. Simpler days…simpler brakes. While the Badger Coaster has a brake (in fact, I don’t think my wagons ever did), it’s just a stick you shove against one of the wheels. Ouch! If one was going to race downhill I’d rather be in that tin pedal-driven Packard automobile. 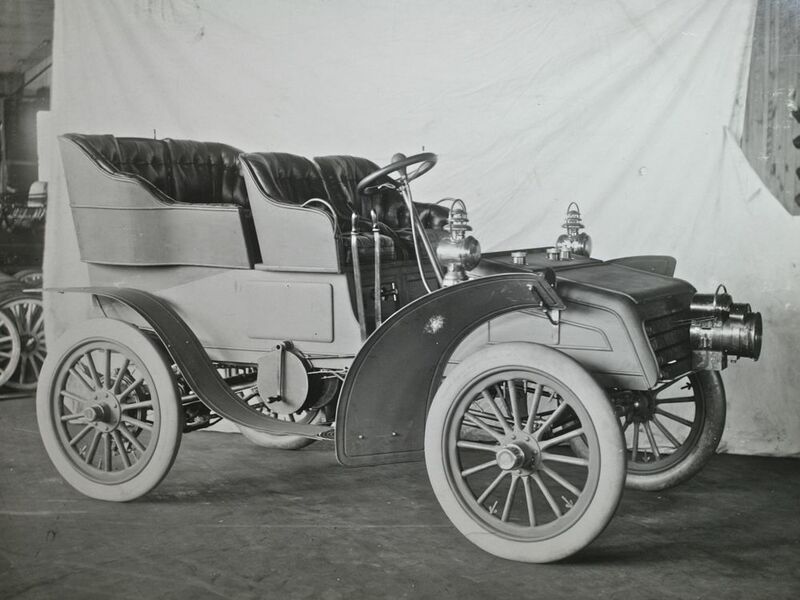 Spear and Company were rather forward-looking for 1903 (or thereabouts – the catalog’s exact date is uncertain) and the boy’s vehicle looks as snappy as a real Packard, right down to the starter crank in the front. This was before Henry Ford’s Model T became every boy’s idea of an auto – the real Packard was an upmarket vehicle, and at nearly $7, the toy was not cheap either. But the Spear brothers specialized in selling on credit (just look at the front cover! 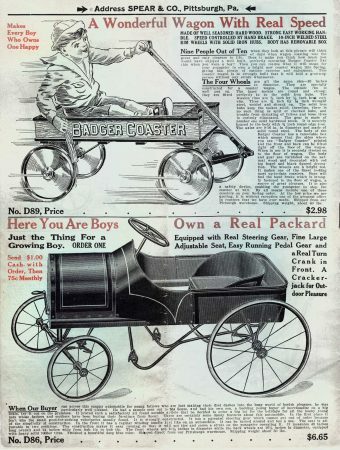 ), and so for $1 down and 75 cents a month your sons could be “making their first dashes into the busy world of boyish pleasure” and easing their way into a fast-paced 20th century in which the automobile was certainly a defining factor.